In a collaborative effort, Sycamore Land Trust and the United States Forest Service recently added 14 acres in Monroe County to the expansive Hoosier National Forest (HNF). Fourteen acres might seem like a drop in the bucket when considering the entire HNF covers more than 204,000 acres. 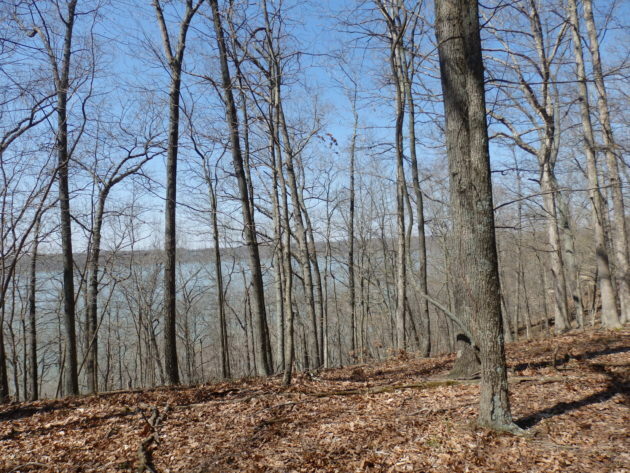 But this hilly parcel of hardwood forest located near the HNF’s Hardin Ridge Recreation Area offers important wildlife habitat, improves public access to the Monroe Lake shoreline and enhances watershed protection. Sycamore acquired the parcel in 2016 after keeping an eye on its availability for several years, then acting quickly to purchase it when it became available through a tax sale. Staff at Sycamore worked with the Forest Service to complete the deal that covered Sycamore’s costs and ensured permanent protection for the property. About the United States Forest Service: The U.S. Forest Service manages 193 million acres of public land, provides assistance to state and private landowners, and maintains the largest forestry research organization in the world. Public lands the Forest Service manages contribute more than $13 billion to the economy each year through visitor spending alone. Those same lands provide 20 percent of the nation’s clean water supply, a value estimated at $7.2 billion per year. The agency has either a direct or indirect role in stewardship of about 80 percent of the 850 million forested acres within the U.S., of which 100 million acres are urban forests where most Americans live. For more information, visit www.fs.fed.us.